Working more recently with the senior population in helping them “rightsize” into the next season of life, there is a pattern that permeates this population. First of all, they are tired. Having lived life to its fullest, raised their family, taken care of their homes and unfortunately some have major health issues. So making that change into the next season of life whether it’s to an Assisted/Senior Living facility, a smaller home or just de-cluttering their current home is overwhelming. They have years and years of “treasures” and find it hard to part with them. Or if they are willing to part with them, they struggle with understanding that others don’t find their treasures as valuable. But a really hard concept for this generation is the cost it will take to de-clutter and find a new home for their treasures. I know for my parents who are 85 and 90 respectively, they find it hard to pay for these services; especially if that payment was larger than their mortgage. They have been in their home for 60 years and had a mortgage for the first 22 years and that mortgage was $66 per month. Can you imagine? So to be told that it would take $300 – $1300 to clear out their basement is hard for them to comprehend and justify. Could we be there someday? Sure. When you live in a home for so many years and you hold onto all your belongings, it will be overwhelming. So when you finally get to the point in your life that you need to or want to purge, the process is hard and the cost can be high. What is my recommendation? Begin now. It’s very fundamental. At a minimum, once a year (preferably twice or each season), go through your home and purge. Start from the top and end in the basement. 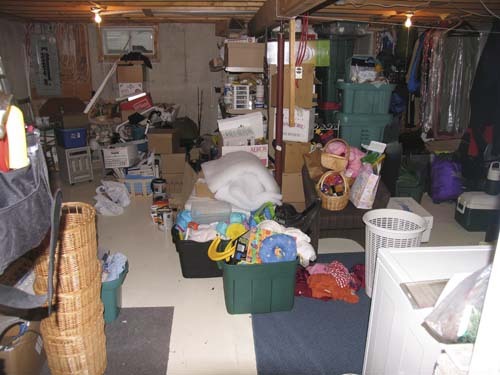 Make a commitment that you will find 5, 10, 20 items that you no longer use, need or want and find a new home for them. You can give them away, donate them or just toss. If something is broken, dirty or not working, don’t donate it. All you are doing is creating more work for the organization you are donating to because they will have no choice but to toss it. Donate only items that can be used. So begin now while you have the energy and ability to purge. Don’t wait until it becomes so major a project that the cost and time will overwhelm you. And get ready because January is Get Organized Month!